More than 15 different game mechanics. Matchmension: House of Mist is rated 2.5 out of 5 by 11. Rated 4 out of 5 by cabanaeast18 from Good game, bad cursor. I would have bought this in a flash but the cursor was a DRAG. I really liked the story line, the graphics, music and everything except the overlarge cursor. There was no option to get rid of it. If that option is given, I'll buy it in a flash! Rated 4 out of 5 by mkgermany from A fun Match 3! I am enjoying playing this game - a colorful, fun Match 3 experience. One can play in relaxed or limited moves mode. 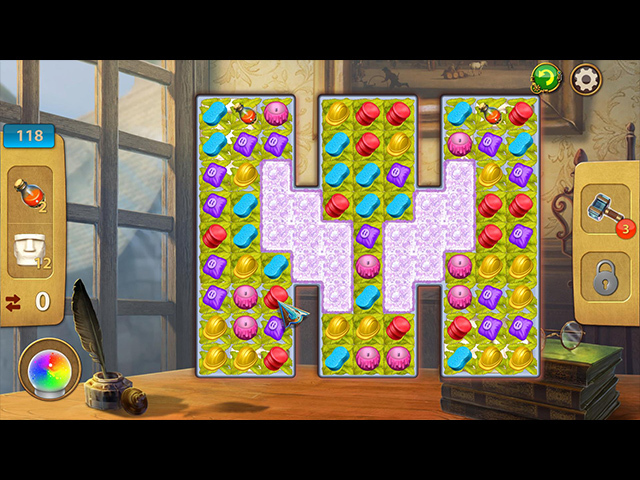 You play Match 3 levels to earn stars, which in turn can be used to upgrade the mansion. I wish the developers had invested in an English-speaking proofreader, although this game is better than some others in that respect. However: I'm sure the title was meant to be "Matchmansion" rather than "Matchmension"! Rated 3 out of 5 by laladykat from Cannot complete the game I enjoyed this game until I got to the end and found that I needed 2 more stars to complete it and there were no more levels to play. Love the graphics and the music. Rated 3 out of 5 by bluegill1 from Ok if you're 12 I am an older guy. I find match 3 games enjoyable when they assume those who play are past middle school, such as the recent Jewel Match games. I'm fine with the cartoonish offerings as far as they go, though I wouldn't buy them; but, please, please, can we have some match 3 games that adults can enjoy. Come on Suricate, more please! 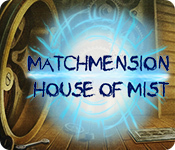 Rated 3 out of 5 by biscuitsmama from A RATHER HO-HUM MATCH 3 GAME Matchmension: House of Mist is another in a string of match 3 games that are not very challenging or even all that much fun. The gameplay simply didn’t grab me and although the story is good it simply isn’t enough to keep me engaged. The match 3 portion of the game seemed nothing more than removing the tiles and although there were power-ups to earn they only exploded a set number of tiles. There was some variety with the varying tasks but not really that much that it made the game exciting. So although some of you might really enjoy the game, for me it is a pass. As always, please try the demo to see if House of Mist is a game you will like. Happy gaming! 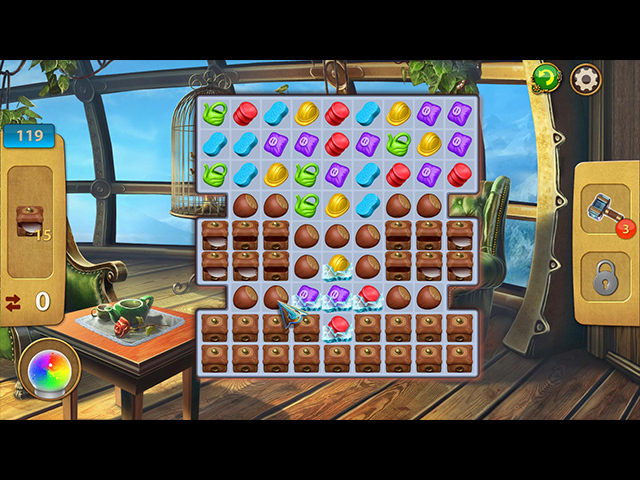 Rated 3 out of 5 by pennmom36 from LOVED THE STORY & MANSION UPGRADES BUT THE MATCH 3 GAME ISN'T VERY EXCITING This is another Limited Moves Match 3 game that can be played in a Challenging Mode (limited moves) or Relaxed Mode with an infinite number of moves. I found the mechanics to be slow to respond and clunky, it just doesn't flow as seamlessly as it should, and the grids themselves are too basic and present no real challenge to seasoned Match 3 players. The tiles themselves are large and uninteresting such as sponges, construction hardhats, watering cans, and a red tile that I still have no idea what it's supposed to be? In true Shaman Games fashion, the storyline has a steampunk vibe and an interesting plot. You have just been awarded a mansion and a robot butler, and the mansion is in dire need of an overhaul. The plot takes some unexpected turns of events when you discover things aren't as rosy as you thought. You will upgrade the mansion with the Stars you earn playing the Match 3 games, 1 star for each level and each upgrade or task usually requires a two-part or 2-3 stars to complete the task. You can choose from 3 different bonuses at the start of each level and large matches will earn Power-ups on the board in the form of bombs of various strengths and coverages. When you detonate the bombs, it fills the Rainbow Meter, once filled you receive a Rainbow Ball on the board (with each refill) and the ball will remove all tiles of whichever tile it is swapped with. 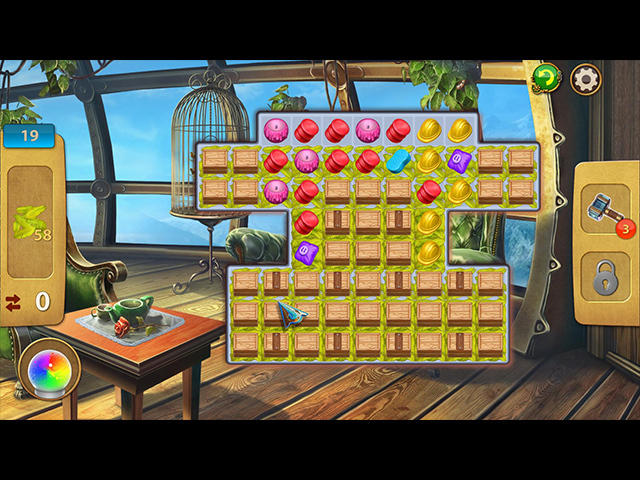 After completing the level goals of removing a specified number of specified tiles, making matches on tiles covered in leaves, removing the wooden crates or hidden items within etc. you have to wait for what seems to be an eternity while the computer finishes playing out your remaining Moves and detonating bombs they created. I loved the storyline and the plot twists, I enjoyed upgrading and cleaning the mansion, I didn't even mind the robot butler, but the Match 3 game just wasn't all that thrilling for me personally. Rated 2 out of 5 by bessiegirl from good grief This would have been a 1 star if I used the word "hate" in my vocabulary. I actually thought since this was a "new" game that it would be somewhat "adult". First, you cannot eliminate the tutorial which treats you like a child, second, BIG, COLORFUL items on the playing board. I actually felt like I was in pre-school, third, the "building" section of the game has this really annoying robot running around. I love match 3 games, and there are some amazing, well developed ones out there, but they are few and far between and this isn't one of them. Why is it so hard to find good match 3 games? Rated 2 out of 5 by Volauvent from Mushy cursor + forced tutorial Ah look - the colors are pretty, the sound effects are okay, and overall, this would be a good rainy day game if it weren't for the fact that you're forced through a tutorial as if you're a little kid - you can't skip it. On top of that, the cursor lags so that when you're pointing to one side of the board, the star cursor is still behind at the other side. I don't get the feeling that much thought was put into this game; there's s nothing new. It's as if they pulled the last one off the shelf and merely gave it a new name. I don't recommend this game. Rated 1 out of 5 by sdawn20 from Waste of Time I could get past some of the issues that other players mentioned in their reviews. However, after forcing myself to complete the game, imagine my surprise to find that there are not enough playable levels to actually do so. There are 250 levels. You need 252 levels to complete the story. Rated 1 out of 5 by Thunderhorse1 from Disappointed. As a lover of Match 3 games, I was pleased to see this one, I thought it would be something new instead of the usual "Series" games we get. Unfortunately as soon as I started the demo I could see that it was one of those annoying games where you can't make another move until the tiles have finished dropping. That in itself was enough to put me off, plus the icons are really clunky, not the smooth running game I was expecting at all. It does have an option to play in Relaxed mode, which is my reason for giving it 1 star. Apart from that, it was so slow and boring. I couldn't even find a way to exit the game without going into Task Manager. This one is definitely not for me. Restore the greatness of a gorgeous mansion, using the power of stars! Play Match-3 levels, earn stars and improve your estate!